The Bonneville Fish Hatchery is the “it” location, especially if you are a salmon. At the hatchery the fish are the stars of the show and depending on what time of year you visit, the experience can vary greatly. During the late summer and early fall, visitors can witness the spawning operation, where ODF&W workers sort and handle the hatchery operation with returning salmon. But don’t worry, the hatchery is open year-round and features an educational opportunity no matter what time of year you visit. From watching ODF&W workers sort incoming salmon, to harvesting eggs and caring for young frys, finglerings and smolts, each stage of the operation is on display, and explained by either videos or audio explanations that can be played. The hatchery, which was built in 1909 and continues to be the largest of Oregon’s 33 hatcheries, is located in the Columbia River Gorge, near Bonneville Dam. The hatchery is to the left of the entrance to the dam. The staff at the hatchery are normally busy keeping the operation running, so tours are self-guided and mostly outside, so make sure you glance at the weather forecast before heading out. Oregon, and the gorge in particular, can have rapidly changing weather, and if you want to enjoy the highlights of the hatchery, be prepared to be outside. The first stop should be a kiosk near the gift shop that has slick brochures that will give you a step-by-step tour of the hatchery. Also, make sure you bring quarters, because if you want to feed the fish at the hatchery – an experience kids love – you will need change. The pamphlet has a map with the tour route, which will take you from the egg incubation rooms to sturgeon, trout and salmon viewing ponds and areas. One of the highlights of the tour is seeing “Herman” the sturgeon, a 70-year-old, 10-foot long, 450 pound sturgeon that you can get eyeball-to-eyeball with in a viewing room. In addition there are natural ponds where you can feed the huge trout, and also feed smaller fish that are growing to get ready to be released. At the natural looking ponds, kids can feed the fish and see schools of oversized trout jump, splash and swim about getting excited about being fed. Make sure to visit the Oregon Wildlife Heritage Foundation gift shop at the hatchery, which also has snacks and beverage in addition to stuff animals, keychains, clothing and other items. All proceeds go toward grants to help aid and assist fish and wildlife projects. 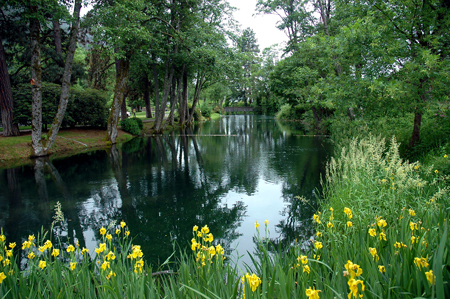 (From the ODF&W website): Bonneville Hatchery was first named “Central Hatchery” and was built in 1909. The hatchery receives thousands of visitors daily. The average number of visitors to the hatchery each year is one million people, from all over the world. The hatchery raises 8 million Fall Chinook, 1.2 million Coho, 200 thousand Summer Steelhead, and 60 thousand Winter Steelhead. Adult salmon begin arriving at the hatchery in September and are then sorted through before spawning begins. Spawning begins during the last week in October and continues until the beginning of December. As part of their natural life cycle all Pacific Northwest Salmon die after spawning. There are also at least 40 different species of birds to view at Bonneville Fish Hatchery. What to bring: Weather appropriate clothing as most of the tour is outside. In addition to feed the different fish around the site, you will need quarters and while the gift shop will make change, bring your own to skip the line in the gift shop for change. Bring cameras ready for outdoor photography, and during the spawning times some of the attraction is in doors, so a flash would be recommended. Season: The hatchery is open year-round, but there are times of year with more activity. Adult salmon spawning takes place from late September through early December, and from August through November salmon that have returned are sorted into holding ponds for processing. During these times it’s also good to visit the fish ladder where you can see salmon returning passing through the Bonneville Dam fish ladder. Getting there: The Bonneville Fish Hatchery is nine miles east of Multnomah Falls on Interstate 84. The exits for the hatchery are clearly marked and are the brown exits denoting a park.